It only does everything. With Blu-ray gaming and movies all playable in stunning high definition, the ability to download games, movies and more from the PlayStation Network, built-in Wi-Fi, Internet browser and hard drive, and now PlayStation Move, the PlayStation 3 can be enjoyed by every member of your family. Move into the most immersive gaming experience ever with PlayStation Move and the PlayStation 3 system. 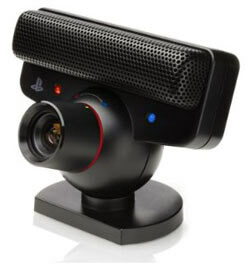 The PlayStation Move pairs with the PlayStation Eye camera to provide the world's most accurate motion gaming experience. So whether you're hitting a home run, taking a long-distance sniper shot or tapping in a 3 foot putt, your every move is translated into the game with complete precision. It's the world's most immersive gaming experience ever, and it's only possible on the PlayStation 3 system. The PlayStation Move 320 GB console bundle is the ultimate way for players to discover the extreme power, versatility and sensitivity of both the PlayStation 3 and the PlayStation Move motion controlled gaming system. The bundle consists of a slim designed PlayStation 3 console, with the massive 320 GB hard drive configuration, a DualShock 3 wireless controller, a PlayStation Eye camera peripheral, a PlayStation Move motion controller and a copy of the PlayStation Move game, Sports Champions. Together these components provide all the pieces necessary to fully experience the advanced motion controlled gaming only possible with the Move system, as well as the wider world of digital entertainment available with the PlayStation 3. The ultimate PS3 Move bundle. New 320 GB HDD with standard DualShock 3 controller. The Move motion controller puts motion capture in the palm of your hand. The PlayStation Eye camera peripheral literally puts you in the game. Sports champions is the perfect multiplayer introduction to the PlayStation Move motion capture gaming system. With Blu-ray gaming and movies all playable in stunning high definition, the ability to download games, movies and more from the PlayStation Network, built-in Wi-Fi, Internet browser and hard drive, and now PlayStation Move, the PlayStation 3 can be enjoyed by every member of your family. Move into the most immersive gaming experience ever with PlayStation Move and the PlayStation 3 system. The PlayStation Move pairs with the PlayStation Eye camera to provide the world's most accurate motion gaming experience. So whether you're hitting a home run, taking a long-distance sniper shot or tapping in a 3 foot putt, your every move is translated into the game with complete precision. It's the world's most immersive gaming experience ever, and it's only possible on the PlayStation 3 system. As with previous models, the PlayStation 3 320 GB system features an IBM "Cell" processor and a co-developed NVIDIA graphics processor that together allow the system to perform two trillion calculations per second. Yet the 320 GB system manages to improve on this with its 45nm version of the processor, which although running at the same 60+nm speed as previous PS3 versions, uses less energy. This makes the unit's smaller size and quieter fan possible. Along with the traditional AV and composite connections, the 320 GB system also boasts an HDMI (High-Definition Multimedia Interface) port, which delivers uncompressed, unconverted digital picture and sound to compatible high-definition TVs and projectors. (The system is capable of 128-bit pixel precision and 1080p resolution for a full HD experience) This console also provides for an extreme sound experience by supporting Dolby Digital 5.1, DTS 5.1, as well as Linear PCM 7.1. Finally, it features cross connectivity with your PC network and PlayStation Portable (PSP) and its pre-installed, 320 GB hard disc drive allows you to save games as well as download content from the Internet. 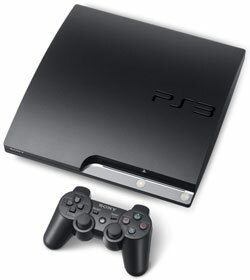 Unlike some other models of PlayStation 3, the 320 GB system does not offer backwards compatibility to PlayStation 2 games. The DualShock 3 wireless controller included in the PlayStation Move 320 GB console bundle provides the most intuitive game play experience, with pressure sensors in each action button and the inclusion of the highly sensitive Sixaxis motion sensing technology. Each hit, crash and explosion is more realistic when the user feels the rumble right in the palm of their hand. It can even detect natural movements for real-time and high precision interactive play, acting as a natural extension of the user's body. DualShock 3 utilizes Bluetooth technology for wireless game play and the controller's detachable USB cable to seamlessly and automatically charge the controller when connected to the PlayStation 3. By integrating all of these features into the popular PlayStation controller design, the DualShock 3 further enhances the advanced gameplay experience only available on the PlayStation 3 system. The PlayStation 3 320 GB system features HDMI + Bravia Synch functionality. Bravia Synch allows connectivity between Sony HDMI products, without having to utilize multiple remote controls. This means that with the push of one button users can control compliant Sony devices connected to your PS3 via HDMI cable. The PlayStation 3 Move console bundle includes the building blocks of the PlayStation Move motion-controlled gaming system, the Move motion controller and PlayStation Eye Camera. Equipped with a three axis gyroscope, a three axis accelerometer and terrestrial magnetic field sensor, during gameplay the PlayStation Move motion controller tracks the precise movements and the angle of the controller, while the PlayStation Eye camera, aimed at the player, allows the PS3 system to detect the absolute position of the controller in 3D space. Together this facilitates the highly sensitive movement tracking and intuitive gameplay that projects the user on-screen and provides realistic and responsive movement and actions in-game. 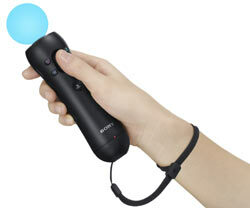 The PlayStation Move motion controller also features the familiar PlayStation controller button orientation, for seamless play from the very first use. Sports Champions is an action-sports game for PlayStation 3 that combines the strengths of the PlayStation Move motion controller and the PlayStation Eye peripheral to provide gamers with true 1:1 motion controlled sports related gaming action. Designed with both casual and hard-core players in mind, Sports Champions features six events ranging from table tennis, to gladiatorial combat, and contains three varied gameplay modes and 10 playable characters to assume as the player and up to three friends battle for the glory of capturing the in-game Champions Cup. Additional features include the ability to utilize two Move controllers simultaneously in events, 720p video output, PlayStation Network support and more.